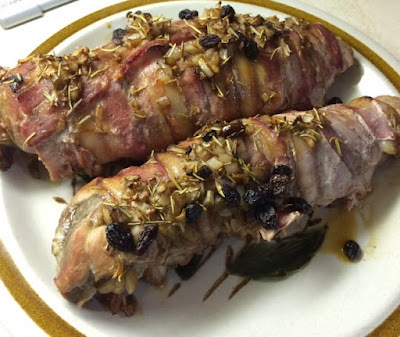 My son and I were talking the other day about ways to make pork loin and he suggested wrapping it in bacon. Because this is such a lean cut of pork sometimes it will come out quite dry if not cooked properly. Wrapping this cut in bacon not only added flavor but juiciness as well. Wrap the bacon around the pork tenderloin and secure with wooden toothpicks. In a pan on medium high heat brown the meat for about 8 minutes turning frequently. In a small bowl combine honey, vinegar, diced onion and Rosemary. Mix well. Place the pork tenderloins in a roasting pan and cover with the honey mixture. Place into the oven for 20 minutes. Remove and add the raisins to the top of the pork. Place back into the oven for approximately another 15 - 20 min. Remove and let the pork sit for about 5 min before slicing.